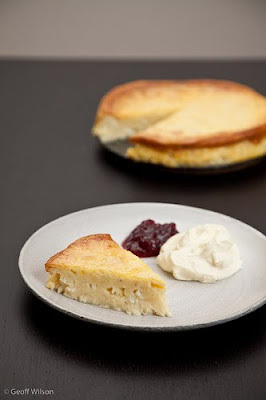 This is a recipe for the delicious ostkaka, which is Swedish for cheese cake. It it not like normal cheesecake however, but is served warm and as Geoff commented when I made it, a little more like custard than a traditional cheese cake. I have used this recipe which uses cottage cheese however the traditional way to make it involves using milk and ostlöpe (rennet) such as in this recipe. Try as I might, I have been unable to find rennet anywhere in Melbourne. The Swedish recipe says you can just buy it at the chemist, so I assume it must be fairly easy to buy in other countries, and I do think I have seen it mentioned in a couple of American recipes as well so hopefully you can get it there. If anyone does know where you can buy it in Australia, please let me know as I would love to make the recipe the traditional way. In the comments of another Ostkaka recipe, I did find a suggestion that an Indian cheese called Paneer could be used as a better alternative to cottage cheese. Another suggestion is to blend the cheese it in a food processor to give it a better consistency. All of this said, this version of the ostkaka is very very delicious and I am sure you will enjoy it! If you are using whole almonds, chop them roughly, otherwise just use slivered almonds (I put these on everything! They are very good with semolina or custard). Stir to combine and then pour into an oven proof dish of some sort. I just used a spring form pan, but you could use a ceramic square dish if you like. Something capable of holding a liter and a half. Bake for 1 hour and then serve warm with whipped cream and lingon berry jam, or any cute berries you have really. Ostkaka is a great traditional desert. Fantastic to see it travel to the far side of the Earth (viewed from Sweden). There are actually two varieties of it, stemming from two different regions in Sweden. Personally I like some bitter almond in there to complement the sweet ones. I did not know there were two different varities. Thanks for clearing that up. Saffranspannkaka looks good too. I'll have to add it to my list of things to make and post here. Hmm your message has just reminded me to hand in a Swedish translation I have due today. Thanks for that... I would have forgotten otherwise. "grötris" is a round grain rice which is used in Sweden to make a kind of rice porridge. It is the sticky properties of the cooked rice that does the trick. The porridge is especially popular around Christmas and in some homes it is the traditional breakfast on Christmas eve, spiced with sugar and ground cinnamon on top. The porridge itself is however available in stores ready cooked all year round. Traditionally you also put a serving of rice porridge ("Julgröt") outside on the doorstep for the house gnome ("Hustomte") on Christmas night.